JOCK Dog Food continually strives to advance your dogs’ health and wellbeing and enrich their lives and lifestyles as they have enriched ours. For this reason, since our inception, we have worked tirelessly in the research and development of superior nutritional products and to grow our understanding of their unique needs to provide information and advice for all dog lovers. We manufacture a full line of natural dog foods and each product is prepared using wholesome ingredients that your dog will simply lap up. With a variety of formulations and flavors, our product range offers ideal nutrition for every stage in your dog’s life. We only use natural ingredients in combination with essential vitamins and minerals and is guaranteed to satisfy your cherished canine’s hunger while promoting a healthy digestive system. JOCK Dog Food strives to maintain excellent product quality and service by ensuring ISO 9001:2015 is successfully implemented throughout the company. Refer to our Quality and Food Safety Policy for more information. Along with the ISO certification, the facility’s food safety concerns are carefully managed and mitigated by a HACCP system. The successful implementation of this system is demonstrated through our FSA Certificate of Achievement which is audited annually by Intertek. The facility has also maintained export approval for consecutive years. This certificate is granted by the state veterinarian of the Department of Agriculture after a thorough on-site inspection and allows our product to be exported to other African countries. 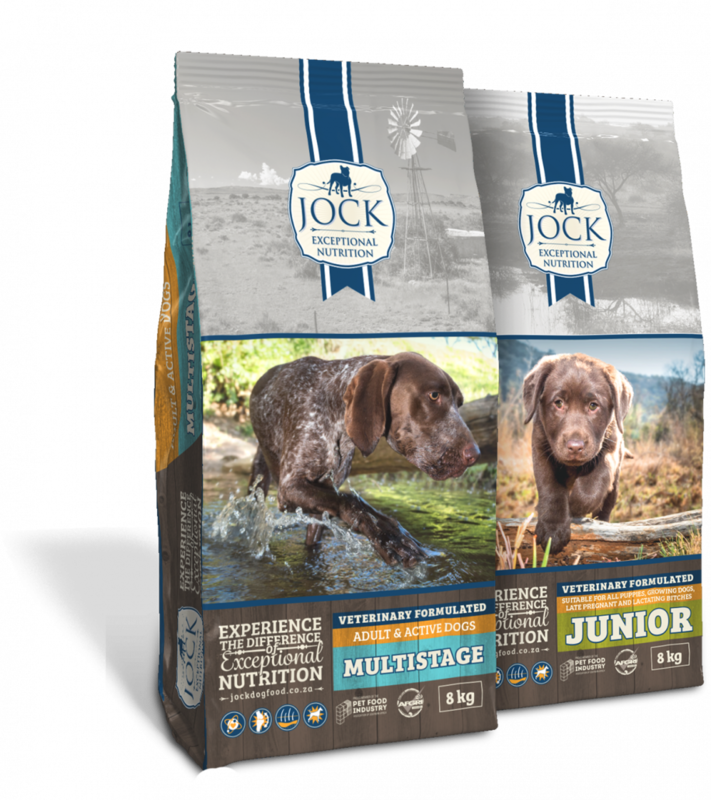 JOCK Dog Food takes pride in the procurement and use of raw materials of the highest quality and each supplier and raw material is evaluated before purchasing takes place. As part of the supplier agreement, specific clauses have been included mentioning Melamine and Heavy Metals. It is the suppliers’ objective to follow our agreement closely and ensure the safety of their product. AFGRI also runs tests for Heavy metals and melamine on a quarterly basis to double check our controls already in place through the supplier agreements. Most raw materials are delivered to the premises with a certificate of analysis for any “contaminants” of concern. On a monthly basis, raw materials and finished products are tested for Mycotoxins, specifically in the case of dog food for Aflatoxin. These results are monitored graphically to determine trends or problems with any specific products. Mycotoxin binders, as well as mould inhibitors, are automatically included into the dog food to ensure there is no risk of Mycotoxin contamination. A strict cleaning programme and monthly Salmonella monitoring is in place to ensure the raw materials and production line are clean and hold no contamination risk. All products produced in the dog food plant go through strict quality procedures before they are released from the plant to the public, this includes an in-line check of moisture levels and a final product inspection on the NIR of protein, moisture, fat and pellet quality evaluation for each batch. Approved antioxidants in the form of a blend of BHT and BHA are used to ensure there is a low risk of spoilage of the product while on the shelf, and every bag is labelled with a production date and shelf life for the consumer’s convenience. NOT SURE WHERE TO GET YOUR HANDS ON OUR DELICIOUSLY NUTRITIOUS DOG FOOD? Click on the button to find your nearest stockist or to buy online.